The black floral pattern is an elegant motif that is carried throughout this wedding stationery suite. The elegant fonts and refinded black, white and red colour scheme make this a beautiful, formal wedding invitation for an elegant affair. The optional pocket can hold information cards, allowing plenty of room for giving guests extra details about the details surrounding your wedding event. This wedding invite and any extra information cards are printed onto a sturdy 300gsm white card. These beautiful classic style wedding invitations are the perfect way to introduce guests to your wedding day. A timeless black and white colour scheme is (optionally) finished off with a red satin ribbon and diamante buckle. Closed, this wedding invitation measures approx 148 x 105mm. Elegant wedding invitations don’t have to be stuffy. 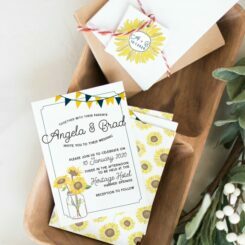 The Classic is a modern treatment of a traditional invitation style. The concertina format has been paired with a diamanté buckle and striking red ribbon. The finishing touch is pairing this piece with a black envelope or a metallic red one. If you have a lot of information to include, you can add a pocket for information cards. Of course any colour ribbon could be added, and there are many pattern options available, to make this piece your own. The invitation opens up to reveal a generous amount of space for details. There is also the option to add a pocket and information cards to this invitation.